"Susan Marie Doyle, Westbrook College, Class of 1978"
Westbrook College student Susan Marie Doyle, Class of 1978, was a Medical Technology major and a Day Hop. 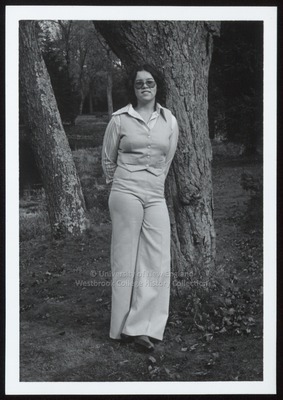 For her senior class candid photo, which appeared in the 1978 Tower Yearbook, she wore pale, bell-bottom slacks with a matching vest, and long-sleeved pale, striped blouse. Her dark hair was parted in the middle and hung to her shoulders. Susan's glasses were darkened, large and round. With hands clasped behind her, Susan leans against a tree trunk on the edge of the Evergreen Cemetery duck pond.